Image caption The RMT said 88% had voted to renew the mandate for action as required under trade union legislation. 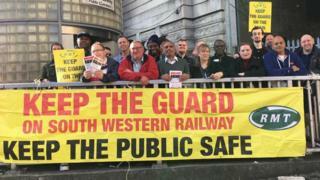 Staff on South Western Railway (SWR) have voted to continue strike action over the role of guards on trains. Their union, the RMT, said 88% had voted to renew the mandate for action as required under trade union legislation. The RMT held six summer walkouts and is calling for a guarantee that guards will remain on trains and a halt to the "rolling out of driver-only operation". SWR said a solution to the dispute would involve "talks, not strikes". The union's general secretary Mick Cash said the ballot showed members were "united and solid". "It is a disgrace that South Western Railway have opted to play for time over the past six months rather than acting responsibly and getting round the table with the union to work out a solution to this dispute that puts safety and the guard guarantee centre stage," he said. An SWR spokesman urged the union to return to talks to avoid "further unnecessary strike action". "Our plans to improve this railway will mean more guards, not fewer; and we have guaranteed to roster a second person with safety critical competencies on all our trains. "A resolution is possible, but it will require talks not strikes." Further strikes are planned on 8 and 15 September.